It was a year ago that I — damn fool that I am — decided to purchase the historic Cross House. All 8900 square feet. Yes, you read that right. And all 8900 square feet needed work. In my first post I articulated the reasoning behind the decision. If such a decision CAN be reasoned. I closed at the end of February and began work on March 1, 2014. The first project was one I was itching to start: restoring the grand opening of the main staircase. The opening had been shrunk during the 1920s conversion of the house to apartments. I had the original drawings confirming the 1894 configuration, and so went at it, as detailed here. After that fun project was completed, I discovered that the rear of the house was likely to collapse. I kid you not. You see, a portion of the rear of the house, as built, loaded the roof, second-floor exterior wall, and the first-floor exterior wall over, well, nothing. All this weight was just sitting on the first-floor floor joists, which extended PAST all this weight, and east about five feet to become the back porch. 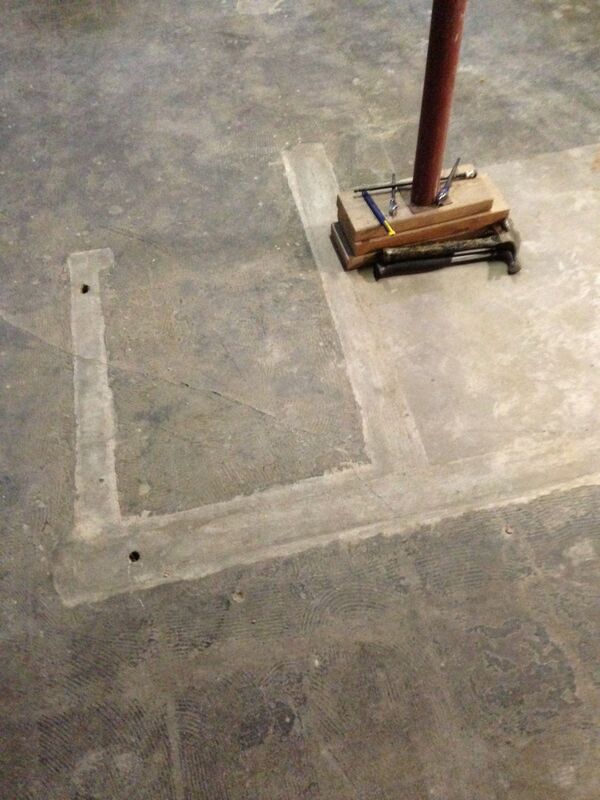 So, the FOUNDATION, which should have been UNDER the three levels of weight, was FIVE FEET…over a bit. Both triple 2x12s holding all this weight had been devoured by termites. One of the triple 2x12s had an eight-inch hole cut through it to run a ton of electric lines through. In short, one triple 2×12 was swiss cheese, and the other triple 2×12 joist was swiss cheese AND was really now a triple 2×2. And swiss cheese and 2x2s cannot support three level of weight. While staring at this disaster, trying to figure out what the hell was going on structurally, full comprehension suddenly and alarmingly formed in my mind. I did not hesitate; I bolted. There was NO WAY I was going to dally in the area. Within an hour we had the area supported by temporary columns. Whew. While freaking out about this near-distaster, I discovered that the south kitchen wall was virtual, along with two adjacent walls at 90-degree angles. Some sleuthing discovered that poor gutter maintenance over the last 120-years caused massive rot in the two inside corners, and this, of course, became a restaurant deluxe for termites. We did not need hammers to pull the wall out. It came apart as you would expect a wet sponge to. ABOVE: Everything behind the Tyvek is new. Directly ahead is the kitchen wall. A huge double window goes there. Luckily it was not rotted, and will be back in place by spring. To the left is the powder room; to the right is the servant’s hall (in 1894) but soon to be the breakfast room (in 2015). The previous owner installed, at great expense, four new high-efficiency pulse boilers. God bless ’em. But two were not working. I am the kind of person who like things to work. I once had a 25-year-old beat-up pick-up truck. The cruise-control did not work. I wanted it repaired. The mechanic shook his head in wonderment. “If it is there, it should work!” I exclaimed. Thus, the non-working boilers needed attending to. It developed that one needed a 5 cent piece of plastic in just the right spot. Once this was slipped in (cannibalized from the other non-working boiler) it fired right up. Whoee. The other boiler needed parts. I was quoted $1700. For parts? NO WAY, MAN! “Let’s just replace the boiler,” I replied. Sensibly. Oh. Suddenly $1700 seemed reasonable. And so it was done/spent. The previous owner installed central AC. As the house retains its original radiator system*, there was no ductwork. So ductwork was snaked through all four levels. 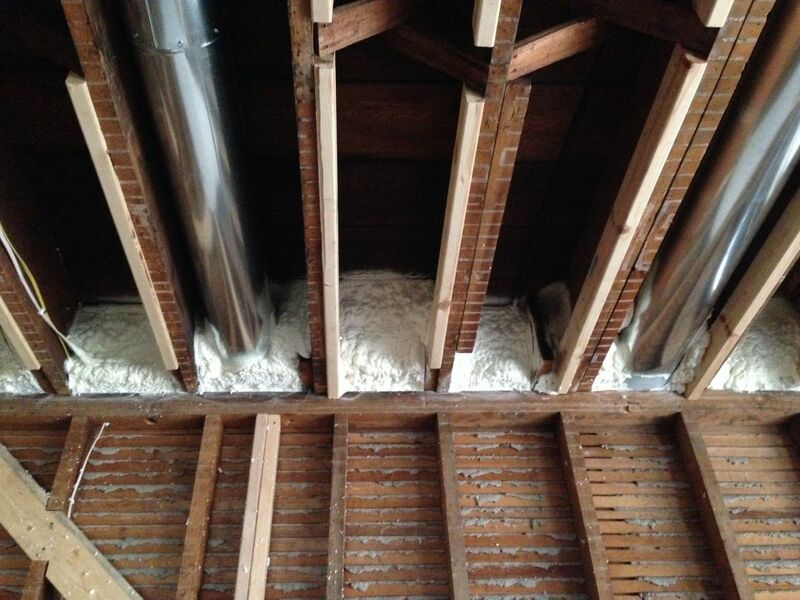 The ducts were flexible (kinda like very long socks with a thin layer of fiberglass). Flexible ducting is MUCH easier to install than rigid ducting, and I can appreciate this. With a huge old house, anything which is EASIER has an intoxicating allure. The downside however is that flexible ducting is inefficient. Air just does not want to go through such ducting; no, it wants to just lay down and take a nap (because the interior of the ducting is not smooth, and this hugely hinders air flow). While the air is napping, BTUs are nonetheless furiously adding up to become next month’s titanic-sized cooling bill, even though the house is not actually being cooled. Oh dear. So the Unexpected Budget went up, all the flexible ducting was pulled out, and new rigid ducting put in. And air RACES through smooth rigid ducting (this is why the outer surface of a plane is very very very smooth). 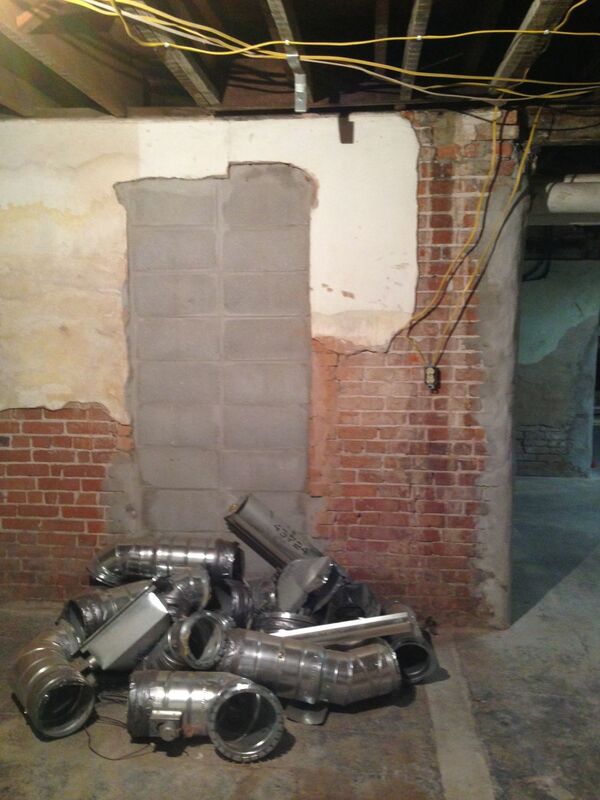 Amazingly, the Cross House has never had return air ducting. Yes, the new-ish AC system did have a few return ducts, but not in locations or of a scale to really make a difference regarding those deadly BTUs. While most of the above issues were unexpected, I had actually been trying to figure out how to install a return duct system before I closed on the house. In the winter, when the radiator system is heating the house, all that hot air will rise up to the second-floor (significantly via the gigantic open stairwell). What is needed is for all the expensively created hot air to be pulled in through those GORGEOUS new return ducts, back down to the basement, and blown out through the new rigid ducting into the basement and first floor registers. This will happen by turning the AC on low fan. This expensively heated air will again rise up (as hot air is duty-bound to do), only to be pulled back down again, in a never-ending loop. The end result is that the heating bills will be MUCH less, that the first three levels of the house will be about the same temperature (for the first time in 120-years), and that occupants of the house will be MUCH more comfortable. Whoee. Without the new return ducts, and because hot air rises, the basement would be cold (even though it has radiators), the first floor would be sorta somewhat warm (not hot) and the second floor would be DAMN HOT. Then all this DAMN HOT air would simply dissipate through the top of the house and help warm Emporia. And all this heated air would be expensive, no matter that it was not making the house comfortable. Even with the boilers fired up, the previous owner resorted to wearing coats and hats and gloves inside the house all winter. If all goes well, my bald head should be comfortably hatless. 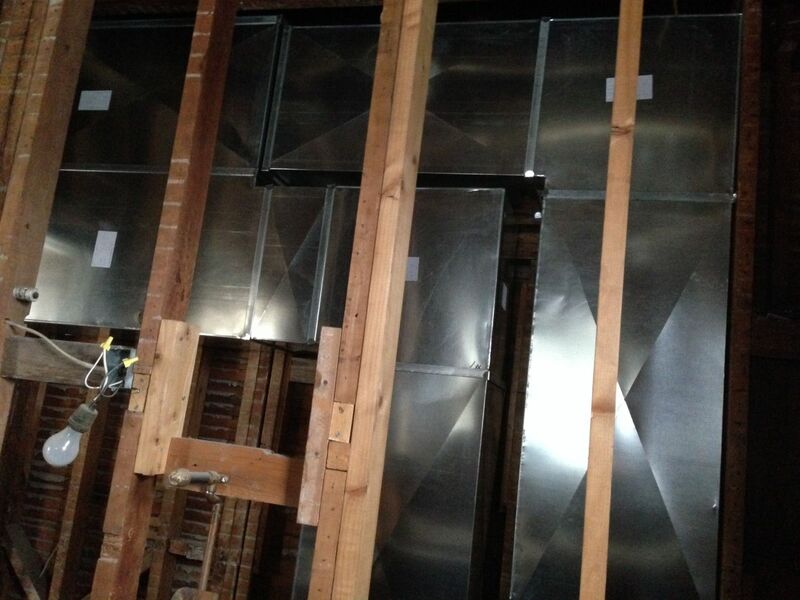 ABOVE: The backs of the return ducts. I love them, and often caress their shiny skin. The ducts are concealed in a closet as I have a horror* over 1894 rooms being visually altered in any way to accommodate modern conveniences (like putting in soffits to install ducting). I am OK, just, with closets being altered. In the summer, the new return ducts will have the same effect with the AC: all three levels will be about the same temperature, the cooling costs will be less, and the occupants will be comfortable. 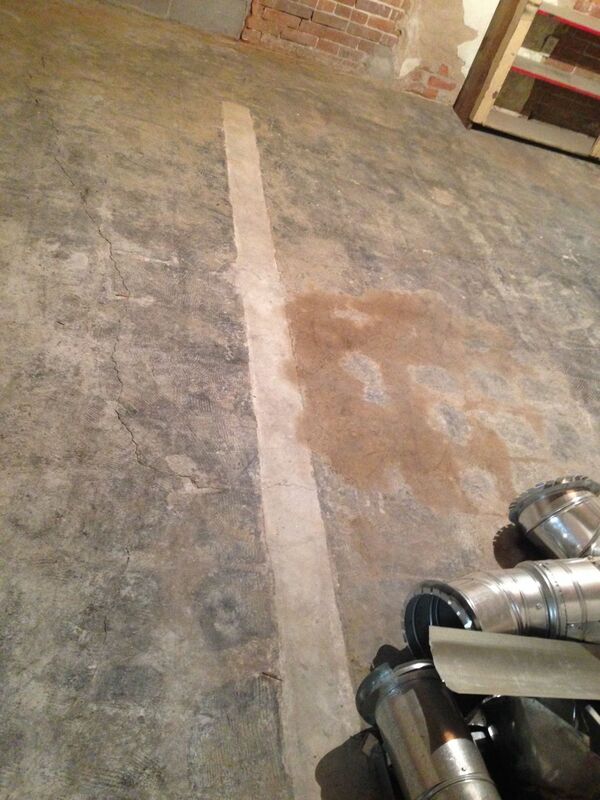 The previous owner laboriously and expensively installed all new copper water lines in the house. But last winter he shut the heat off. Although he drained the pipes, he did not, as it developed, blow the pipes. They froze. And copper reacts poorly to being frozen. So, yet another item was added to the Unexpected Budget: new piping! We have started to install way cool Pex piping. This amazing high-tech stuff is old enough to have some history, and the results are impressive. I love PEX. We are installing three manifolds (one in the basement; one on the second-floor; and one on the third floor (or level four). Manifolds are kinda like junction boxes for PEX. In 1950, Scout Mouse, Jr., turned the Cross House into Mouse’s Palace Motel (New & Modern!). As part of this transformation (how I wish for a time-travel app on my iPhone) the basement of the house was transformed into six bedrooms and each with an en-suite bathroom. All these bedrooms were still there when I purchased the house. 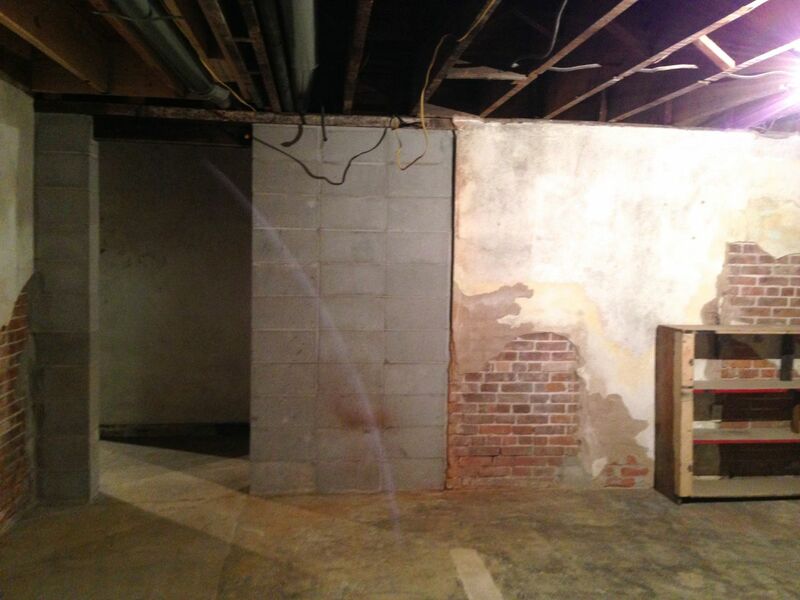 I gleefully tore them all out, thus restoring the grand basement to its original configuration. In order for 1950s guests to access the basement motel rooms, a new stair was installed. 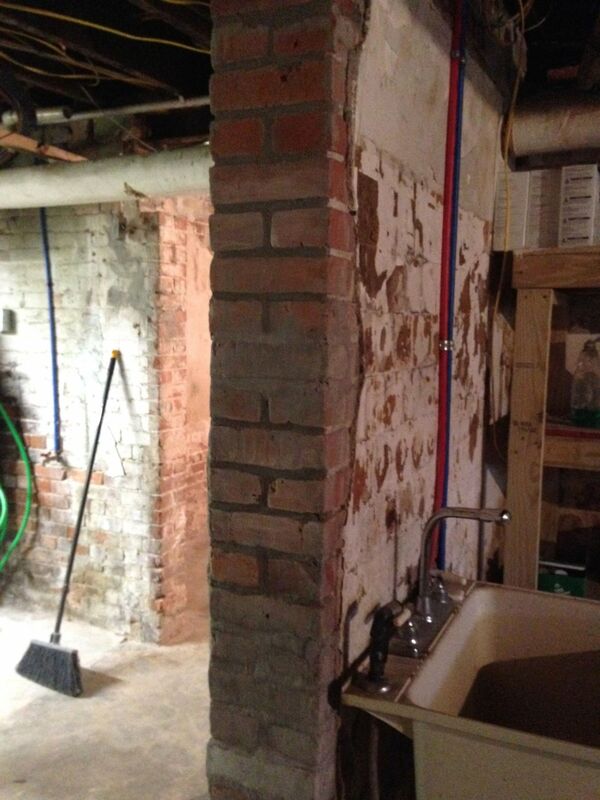 But a brick load-bearing wall was removed because it was in the way. Yikes! Triple yikes! ABOVE: As part of fixing the basement, I had this original opening restored. Over the years the brick had been knocked about and the opening was, ah, jagged. It did not look like an intended opening (all neat) but rather like a tall hole which had been blasted through the structural brick wall. Well, this just would not do. So, I had the opening bricked back up again all neat. While no one will ever know this was done, it pleases me a great deal and I often take a moment to smile at the nice, neat opening. And I think the opening is happier, too. I can sense it. After doing an emergency fix to the back of the house which was near collapse, we had to attend to the front of the house problem. This sagged. And the sagging was progressive. I did a post about this drama. And the Unexpected Budget went up. On occasion I feel a little faint about how many windows the Cross House has. Luckily, they are all original. Unluckily, they have never ever been restored. In short? They are a terrifying mess. I did a post on this drama. I also had a single stained-glass window restored. Only thirty-nine more to go. After doing all the above it was a pleasure doing something which was purely aesthetic: painting the outside in pretty colors! The front doors are two pairs. An outer solid set. And inner glass set. I had the outer set refinished. Began restoring/replicating porch columns, porch lattice, and porch railings. ABOVE: This is the library. I did not remove all the plaster and lath. This happened in 1999 after a fire. 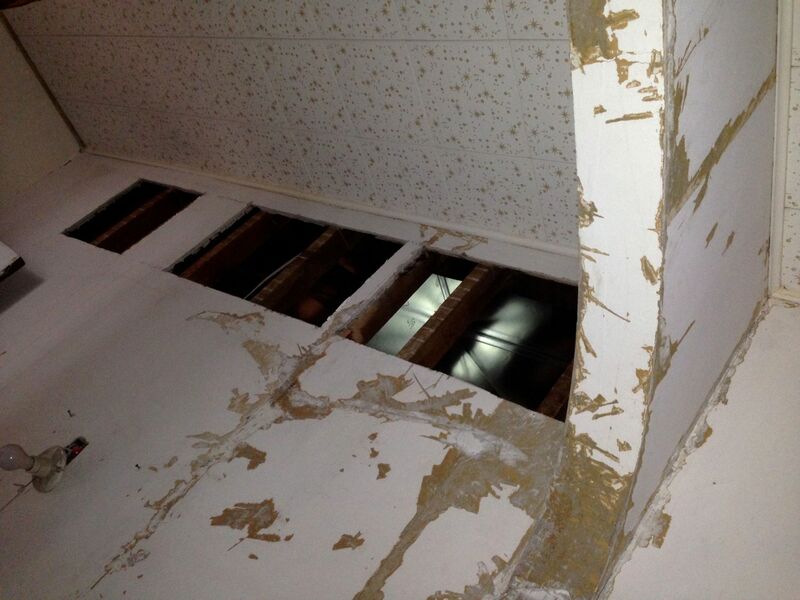 The water from the fire hoses (two stories above) destroyed all the plaster in the library and the sewing room above. What you are looking at is spray foam filling in the “nodules” between the horizontal and vertical house framing. This will stop air from traveling through all the framing. And stopping air from getting IN or OUT of the house is vastly more efficient than insulating. ABOVE: After fifteen years of bare ceiling joists, the library ceiling begins its renewal. December 17, 2014. ABOVE: After fifteen years of bare studs, the library is now fully sheetrocked. December 19, 2014. The sheetrock guys are great. Note just next to the window. See how they carefully cut the piece of sheetrock to infill against the pitiful amount of remaining 1894 plaster? 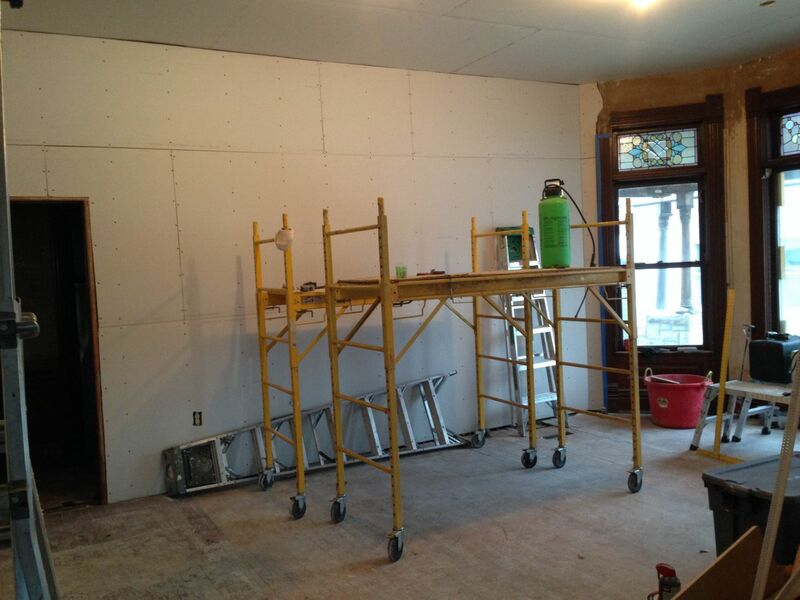 In a few months the wall in the image will be filled with floor-to-ceiling bookshelves, and all filled with books! I will be agog. 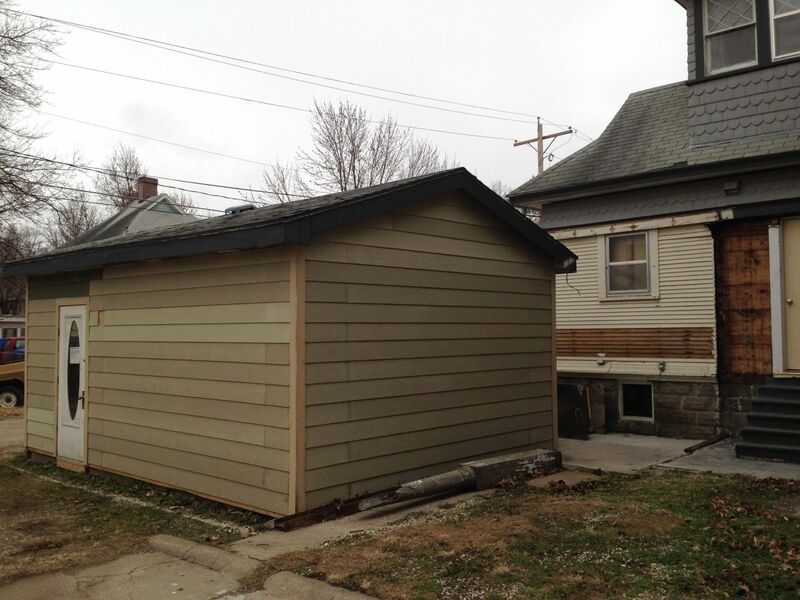 Removed non-original porch to Carriage House. ABOVE: To the right is the Carriage House. It has an adjacent circa-1960 one-car garage. It is not a pretty thing. I plan to install a deck over to the right, so that the kitchen can open onto the deck, which will be the only outdoor space for the Carriage House (which I will rent). In order to install the deck, I first had to resurface the garage because the deck will kiss the garage. At some point I will replace the garage with a larger garage, and one more in keeping with the Cross and Carriage houses. So for now I wanted the garage to look better but on-the-cheap. Hence the concrete siding. Well, once painted in the same colors as the Cross and Carriage houses it will look fine. Oh, the oval-glass door was a gift from Justin. I told him I had the perfect place for it. Well, there are a zillion other things we did in 2014 but all the above are the dramatic highlights. Inserting another steel beam in the foyer, to correct an issue there from Day 1 (a big scary sag). 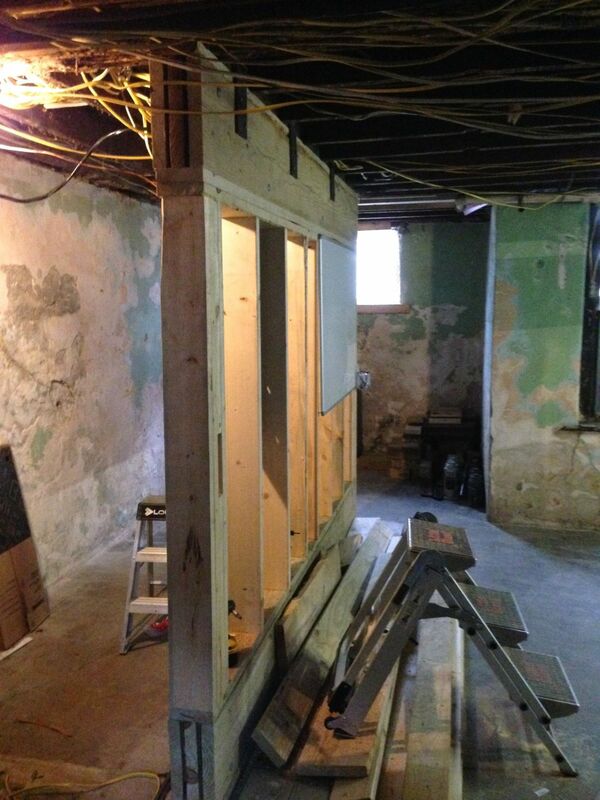 Rebuilding a wall in the kitchen, and a wall directly below in the basement, to help support the second-floor. Termites devoured the original supports. There is a four-story servant’s stair tower. The main roof is a big big bully, and its literally pushing the stair tower away from the house. This issue is progressive (meaning that the gap between the tower and the house gets a bit wider every year). Eventually, there will be catastrophic collapse of some sort. So, I have devised a plan to permanently correct this issue. Because of Issue TWO (above), the back porch needs to be totally rebuilt. The porch “insets” into the body of the house, and the flooring, and underlying floor joists, are swiss cheese due to water and termites. All will be torn out, and pressure-treated limber will come to the rescue! Then of course before we can start making the interior rooms pretty, all the wiring needs to be completed, and plumbing, and my plan to stop air from getting IN the house and OUT needs to be completed. I have applied for several grants, and if these get approved I will have the funds to proceed on a number of other vital vital vital issues which are not structural but are causing significant damage to the house. In short, 2015 looks to be as event filled as 2014. 10 Responses to Whew! 2014, What A Year! 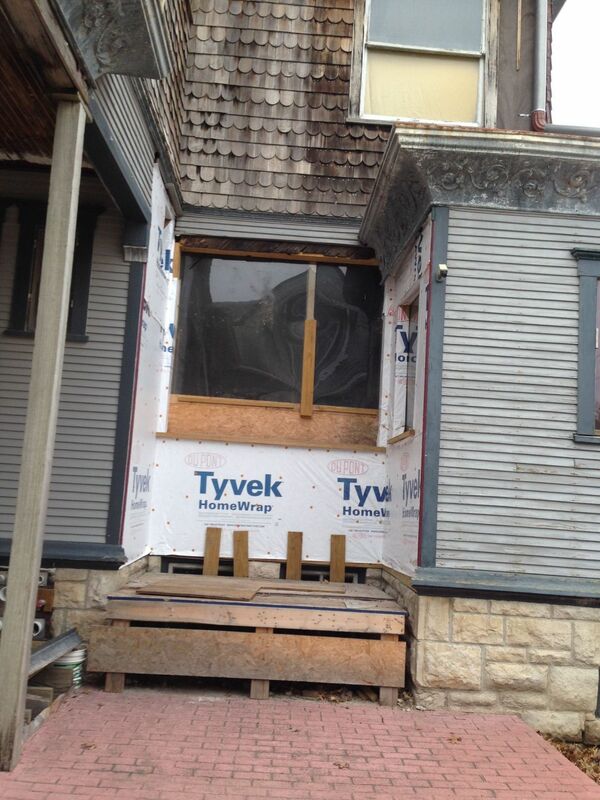 I am thoroughly enjoying reading your blog on process restoring the Ross house. I grew up in Nebraska and there is always a large, imposing home such as yours in most towns. Thank you for sharing and allowing me to live vicariously through your experience. Happy Holidays! I, too wait anxiously to see and hear about the progress being made on Cross House. However; this post makes me think I must be a bit superficial as I look forward to seeing this new paint job and that newly refinished door or this repaired window. You just don’t really KNOW what all goes into making these things happen and how very involved it all is until you hear it in this context. As a lay(person) I truly find it so very interesting and am always envious of anyone restoring an historic house, but I have an ever growing respect for the process through reading your blog, and I’m sure this doesn’t even touch everything involved. It is so obvious through your writings that you truly love doing this and nothing seems to put a damper on your enthusiasm…there’s a lot to be said for that! Congrats on your first year together and best of luck in the next one! Looking forward to a 2015 full of blog posts about the Cross House progress. If this is what one can do on a lighting fixture restorer’s income, I’m changing careers! Wonderful, incredible progress, Ross – really incredible. Your commitment to doing this right truly makes me so very happy and delighted. Forge on! Cross House is so lucky to have you rescue her. Can’t wait to hear what 2015 brings! Much is planned for 2015!!!!!! I am assuming the sistered joists on the ceiling of the library are for the purposes of planar drywall? 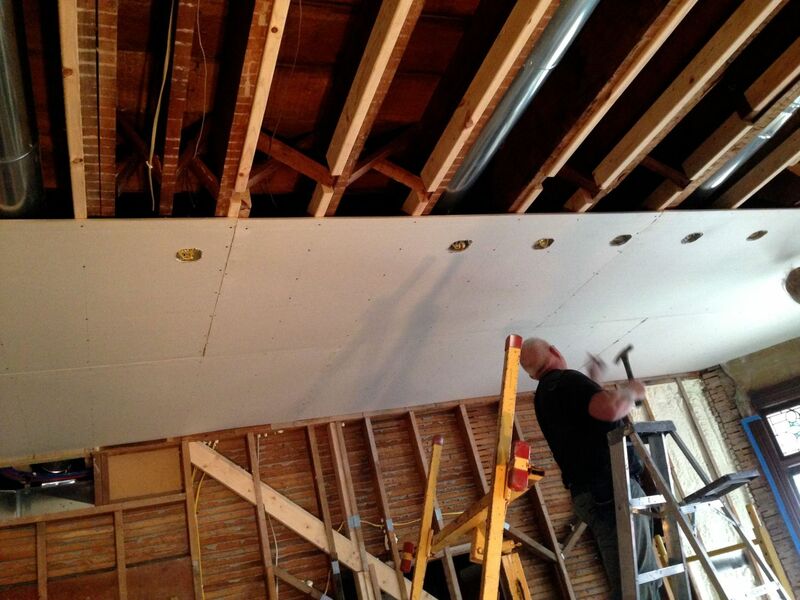 And if so, thank goodness we aren’t the only ones sistering studs and joists for the purposes of planar drywall. Great work Ross. Keep it up. Your blog reads like a page turner. It’s 3:56 in Las Vegas, Nv. as I write this. I couldn’t sleep until I found out how 2014 ended. Needless to say, I am thoroughly enjoying your site. Gotta go, 2015 is beckoning me.